The "Lost Generation" of World War One was not entirely lost, as the many talented, forceful and successful people of the post-war years show. Earlier this year we looked at high achievers who died before their full potential was realised. Did WW1 trauma lead to creativity? But many prominent 20th Century figures survived their 1914-18 ordeal, like those described here. The war influenced their later exploits in many ways, as it could hardly fail to do. Most of all, it spared them. It might have spared others instead - who would later have done as much. We can only guess. Survived: Suffered severe shrapnel wounds at al-Hanna, Iraq, April 1917. Injured by falling timber under shelling in France, August 1918. At Gallipoli in the winter of 1915 Attlee gained a fearsome reputation for bullying his men into keeping fit and warm in the wet, freezing trenches. He was one of the last men out when the Suvla sector was evacuated. He never followed the fashion of blaming the Gallipoli campaign's failure on the First Lord of the Admiralty. "Only incredible blunders marred Churchill's fine strategic conception," he wrote. "Attlee had a very high regard for Churchill," says Attlee's biographer Francis Beckett. "He thought the rest of the government was at fault for not committing itself sufficiently strongly to Gallipoli." Years of social work in the East End of London had made Attlee a socialist - and he was carrying a big red flag when death nearly caught up with him. During a British attack on the Turkish lines in Iraq (then called Mesopotamia), he had run ahead of his troops to plant the flag in a captured trench to alert the British artillery. Cut down by shrapnel, he was carried from the field. After another injury in 1918 he ended the war in hospital - the third time the war had put him there. As Churchill's deputy in World War Two Attlee strove to achieve a joined-up approach to warfare which avoided the muddles he had seen in 1914-18. Beating Churchill in the Labour landslide of 1945 and beaten by him in 1951, Attlee in 2004 was voted Britain's best 20th-Century PM in a poll of academics - pipping his old adversary and colleague. His war experience gave Attlee "inner strength and inner confidence," says Beckett, which prepared him for the enormous responsibility of being Churchill's wartime deputy, and for being a very successful peacetime premier. The story of how the 18-year-old Ernest Hemingway was felled by an Austrian trench mortar on the north Italian front on 8 July 1918 and his subsequent love affair with the nurse Agnes von Kurowsky has been much embroidered by legend, most biographers believe. 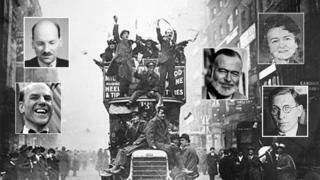 By the time he wrote A Farewell to Arms in 1929, Hemingway was tougher and more cynical about war than the enthusiastic youngster who wrote in 1918: "Oh boy! I'm glad I'm in it!" The autobiographic hero of that book is even encouraged to make up a story that he carried a comrade to a dressing station after he was wounded - a story often told about the real Hemingway. But it is agreed that Hemingway suffered 227 shrapnel wounds in the legs, which needed a series of operations; that he was awarded the Italian Silver Medal for valour, and that he was devastated when the beautiful Agnes, seven years his senior, sidelined him. And that but for the merest chance - the Italian soldier standing between him and the bomb - there would have been no Farewell to Arms, no Nobel Prize, just a fading memory of a keen cub reporter on the Kansas City Star who a friend said was "delirious with excitement" to get into the war. "Hemingway entered the war as enthusiastic as anyone of his generation," says Professor Alex Vernon, author of studies of Hemingway and war. "The war would excite his imagination for the rest of his days, though afterwards, over time, his attitude grew much more complex. "It's enough to say that the war continued to fascinate and trouble him in ways that seem to have demanded he revisit it in his writing until the very end." Elsie Knocker (Baroness de t'Serclaes, from her brief marriage to a Belgian flyer) had many peacetime adventures and setbacks, from running a first-aid post during the General Strike to trying to start a film company. But at 80 she wrote: "Only in time of war have I felt any real sense of purpose and happiness." Badly gassed in March 1918, Elsie was hospitalised and forbidden to return to the forward medical post at Pervyse north of Ypres operated by her and her friend Mairi Chisholm. The only death in the attack was of Shot, her fox terrier who carried messages to the Germans about truces to collect the wounded. Working near the front line since the early days of the war, Elsie and Mairi - pre-war motorcycling chums - were hailed as "the Madonnas of Pervyse" by Belgian soldiers, idolised by the press and awarded the Military Medal. Elsie was "almost addicted to the danger and the goodness of what she was doing", says Diane Atkinson, author of Elsie and Mairi Go to War. Afterwards she struggled to find fulfilment, says Dr Atkinson, but in WW2 she was an "obvious shoo-in for a high-power role". As a Squadron Officer of the Women's Auxiliary Air Force, she motorcycled and flew to look after hundreds of airwomen in remote radar stations, and was twice mentioned in despatches. In 1942 she left the service; her only son had died in action and her aged foster-father needed looking after. She devoted many years to volunteering for the RAF Benevolent Fund, from which, says Dr Atkinson, she got "enormous happiness and comfort". In his autobiography published in 1958, the man who for decades personified the glamour of ballroom dancing in Britain wrote how he went to the western front, then was transferred to the big base camp at Etaples when it was found he was under-age. His duties were "peeling potatoes, cleaning latrines, and waiting in the officers' mess" where he was told to short-change the officers and hand the money over to the mess NCOs, Silvester wrote. Only later, in 1973, did he say that while at Etaples he took part in a firing squad of 12 men who shot six or eight deserters. "To be perfectly honest one never gave it a second thought," he said. "Today you wonder how you were ever able to do it." From Etaples he was transferred to the British Ambulance Unit on the north Italian front, where his experiences closely parallel those of Ernest Hemingway 10 months later, even down to the shrapnel wound in the leg. In World War Two, Silvester - now a leading dancing teacher and bandleader - began a BBC radio show called Dancing Club, giving dance lessons and creating "an illusion of a gay, glittering ballroom... to bring a little glamour into the drab wartime lives of listeners." After 1945 it transferred to TV where it ran for 17 years, while Silvester's strict-tempo dance records continued to sell in the tens of millions. "For true strict tempo dance music, it has got to be Victor Silvester," Strictly judge Len Goodman told the BBC News website. According to his grandson Christopher Silvester, in his old age "he was still haunted by the memories of those killings and the other deaths he witnessed as a young teenager... but at least he survived and was able to lead a life of fun and fulfilment." Banting's war record hints at the determination he needed to push forward his ideas about producing insulin to a point where it could be used to control blood sugar in diabetics. The citation for the Military Cross he won near Cambrai tells how he pressed forward "through intense shell-fire" to a battalion whose medical officer had been wounded. While attending to the soldiers he was himself wounded and "was sent out notwithstanding his plea to be left at the front". Some insist that Banting's ideas and experiments marked only one stage in the production of insulin. Others say the many experiments he carried out on dogs were cruel and ultimately unnecessary. But it is hard to deny that the mass availability of insulin to diabetics stems from the work he led in Toronto during 1921-22. By tying off the pancreatic ducts of laboratory dogs Banting was able to stop the digestive chemicals in the pancreas destroying insulin-producing cells, allowing the insulin to be extracted. He later suggested using the pancreas of calf foetuses, which had not developed digestive functions. "His work has saved or improved millions of lives," says Dr Alasdair Rankin, director of research for Diabetes UK. His birthday, 14 November, is marked as World Diabetes Day and he has a crater on the moon named after him. He survived World War One, but World War Two claimed him. He died in an air crash in February 1941 on his way to England to conduct tests on a flying suit. Pictures courtesy of: Getty Images (top main picture, Banting main picture); AP (Hemingway main picture); Alamy (Hemingway small picture); Imperial War Museum (t'Serclaes small picture); Christopher Silvester (Silvester small picture); Marie Shields collection/ New Tecumseth Public Library (Banting small picture). Why do we remember the poets of WW1 and not the composers? Among other BBC online World War One coverage: Discover how so many soldiers survive the trenches and more about the World War One Centenary.